Richard Hugo. Robert Bly. Sara Teasdale. Sharon Olds. Snorri's Edda. Stephen Dunn. Poems. Prose. Time Line. Books. Someone (implicitly a stranger) observed. Favorites include the 10-year-old girl in "Gyroscope", the elders of "The Old People", and the young wheelchair-bound woman in "A Rainy Morning". Family, mainly in the past (parents, grandparents). Age, death, and the past, including "Turkey Vultures" and "Grasshoppers". The poet himself, including "The Early Bird", "The Washing of Hands", and the brilliant "Tectonics". slapping the grass like drops of rain." Four sections, each named with the title of its first poem. Most (43) are written in a single stanza. 6 poems in 2-line stanzas. 2 poems in 3-line stanzas. 1 poem in 5-line stanzas. 1 poem in 7-line stanzas. 1 poem in 12-line stanzas. 3 poems in long or irregular-length stanza. 7 poems need more than one page. In the first half of the book, the single-stanza poems range from 4 to 38 lines, with a median of 15 lines. 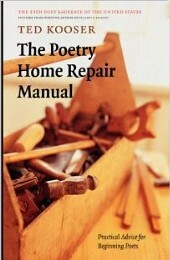 Poetry Home Repair Manual (2005). Revision, and I mean extensive revision, is the key to transforming a mediocre poem into a work that can touch and even alter a reader's heart. It's the biggest part of the poet's job description. It's your job as you revise to think about the presence you're communicating. What will your reader think of the person who comes through the words, and how can your reader's assessment be directed and controlled? One of the hardest things to learn is how poems can express strong feelings without expressly stating those feelings. Can You Read Your Poem through Your Poem? A poem must be something more than an anecdote arranged in lines. Yet artful composition ... can elevate an anecdote into true poetry. The poet Linda Gregg asks her students to take a close look at just six things each day. What seems like a simple discipline turns out to be quite difficult because, by habit, most of us go through our lives without paying much attention to anything ... it's observed details that really make a poem vivid. A line ending is a force in a poem, much like a punctuation mark. That white space out there on the right is an opportunity, and you ought to take advantage of it. ... A poem is a machine of language designed to accomplish something. Whatever the poem hopes to accomplish, the work of writing the poem can't be hurried. ... Each choice the poet makes must bring the poem a little closer to its potential. It is impossible to achieve perfection, but any poem will be more effective if it falls just a little short of perfection rather than a long way short. It's inappropriate to take as your subject somebody's misfortune and make of it a literary event. ... primary items on the 'parts list' for poetry include ... metaphors, similes, and careful description ... [as well as] use of repetition ... and understatement. If you can manage to do it, leave your poem alone till it begins to look as if somebody else might have written it. Then you can see it for what it is, a creation independent of you, out on its own. A poem must be equipped to thrive by itself in a largely indifferent world. You can't be there with it, like a parent, offering explanations, saying to a confused reader, Yes, but here's what I meant!. A poem has to do all of its own explaining. The Poetry Home Repair Manual: Practical Advice for Beginning Poets (2005).